I had a bad freeze in the 17-18 winter. I lost some smaller palms. My big one did fine but is looking bad now. Lots of bark coming off along with a lean. But there is new growth on top. Often by the time you see signs of disease on the outside; it is too late to save. 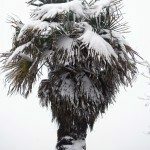 The lean of a Palm is concerning and you may need to have the Palm inspected by a certified Arborist to determine it's viability and safety.